Despite my usual professional appearance, I really am a hippie at heart. I frequent farmer's markets and natural food stores (and bring my own bags). I listen to NPR. I make my own granola. I bake my own bread. I use Dr. Bronner's for everything. I own five pairs of Birkenstocks. And we have a garden in our backyard as well as a flock of chickens. Who says you can only be one thing? I can wear skirts and oversee a construction site. I can shop at thrift stores and work at a big building downtown. To be multifaceted is to be interesting. Or at least I think so. 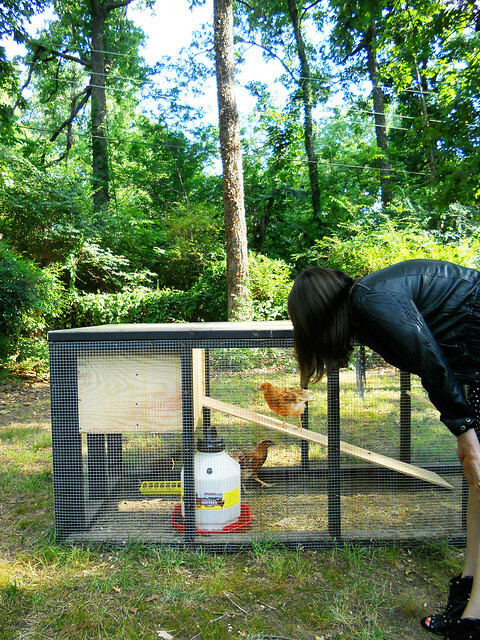 We may have chickens, but it doesn't mean they can't have a sleek, modern coop that just so happpens to match my outfit.